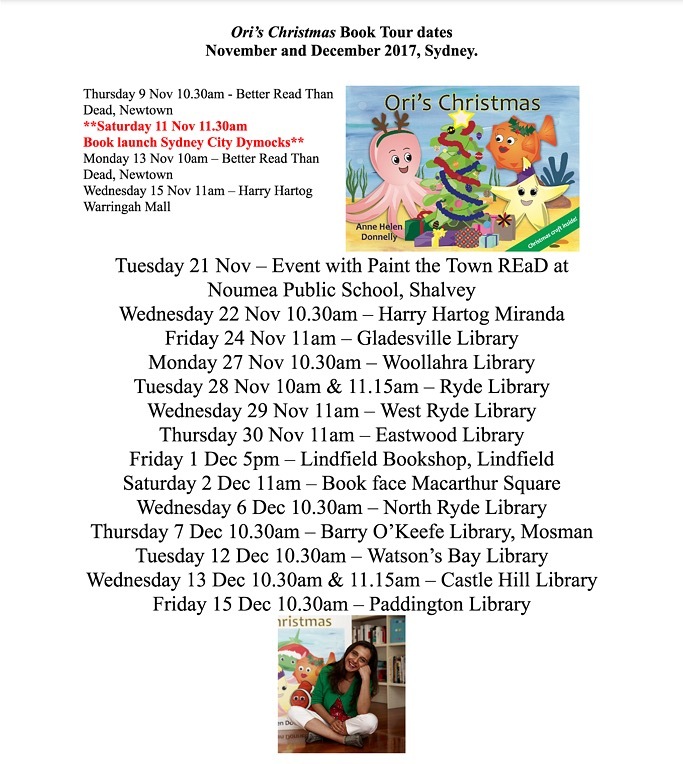 It is a pure joy to celebrate this special time with Ori from ‘Ori’s Christmas‘, who will be sharing his important tips on being able to compromise, and valuing friendship. Thanks for joining us today, Ori! It must have been difficult when your friends didn’t want to compromise with the Christmas activities. How did you feel in this situation? Have you experienced this before? Well, you can see from my picture Romi, I was sad. And a little cranky. I’d gone to the trouble of getting everyone together so we could celebrate this special day and then no-one wanted to compromise. This was the first time they all disagreed. If your readers also had friends with different ideas on how best to celebrate an event, what tips would you give them to best resolve the tension? Remember the bigger picture – friendship, love and kindness are more important than getting your own way. And of course, compromise is good. That way everyone gets a bit of what they want. If you had to choose out of singing carols, clicking pictures, wrapping presents, eating lunch or reaching high in the tree to forego for your friends, which one would it be? Humm, tough one. I like doing all of these activities. But if I had to choose one I would say I would forego reaching high in the tree – we could all wear the decorations instead! Which special Christmas activity do you enjoy the most? Why? Well, I love doing all of the activities – all at once of course. I do have eight legs after all! What’s the best gift you’ve ever received, and what’s the best gift you’ve ever given at Christmas time? 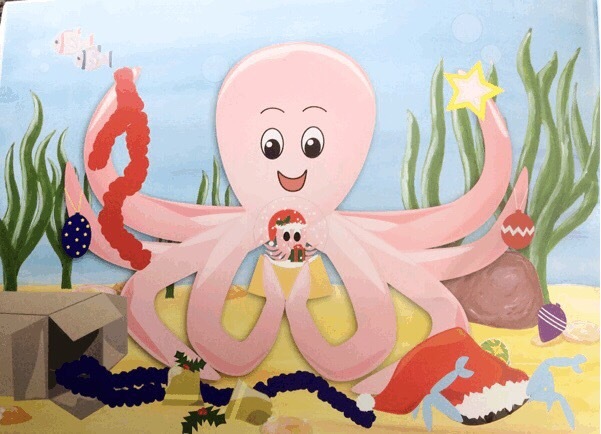 My favourite item I received is my pink octopus snow globe featured in the book. But the present I value the most is my friendship with all my fishy friends. I like to think that is the best gift I give to them all year round too. 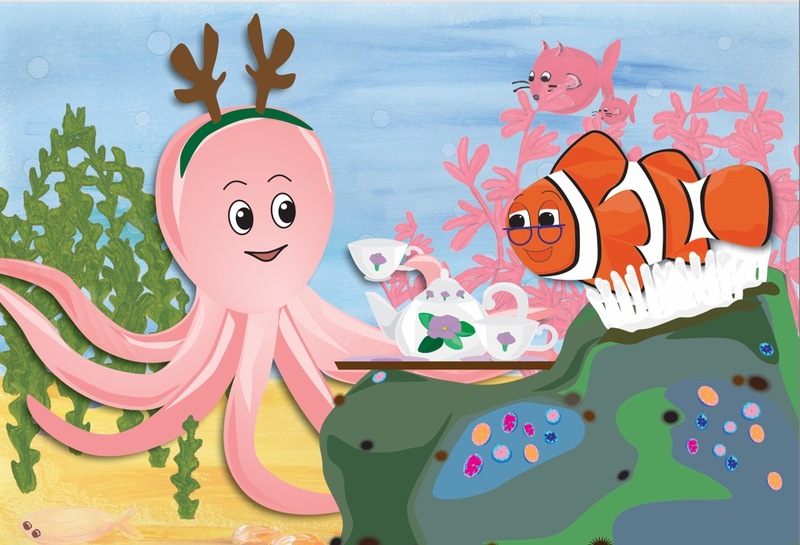 I always try and be helpful, as shown in Ori the Octopus, and I am usually the one who gets us all together to do things like meeting for Christmas. You’ve included an awesome decoration craft inside the book of you and your friends. What skills do you need to complete this? What other talents do you have considering you have eight arms? 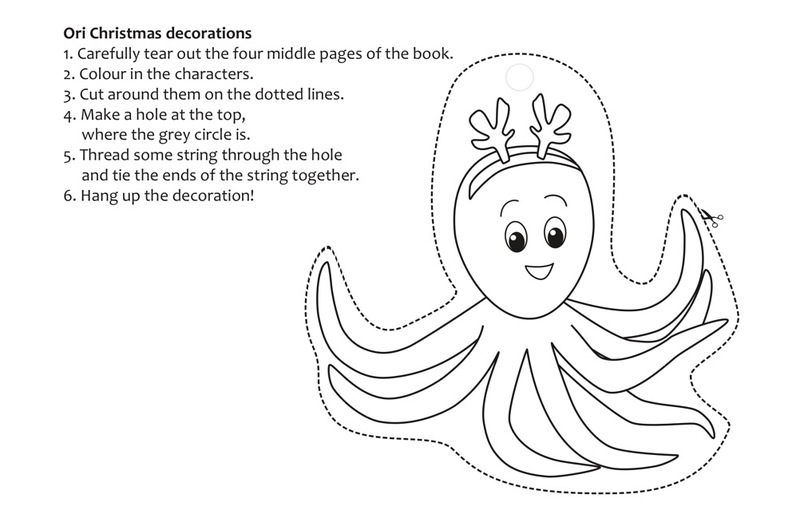 You need to colour and cut out our Christmas decorations and poke a small hole at the top. Then cut some string, thread it through the hole and tie a knot on the end. You can hang it up on the tree or in your room – or wherever you like! I love art and craft myself, all sorts, painting, drawing, clay, sewing, etc. Despite having eight legs, if I want to do a really good job on something, I have to do one thing at a time. Many of your readers would find the story and actions quite entertaining! What do you hope they will gain the most from reading about you? Young readers love doing the actions along with me during my stories, it gets them involved. My book’s themes centre around friendship and how to deal with problems that are common amongst friends. When will you be making your grand appearance? Why did you choose this time of year? Tell us more about your party plans! The book is making its way into book shops as we speak and is available now for purchase on-line. 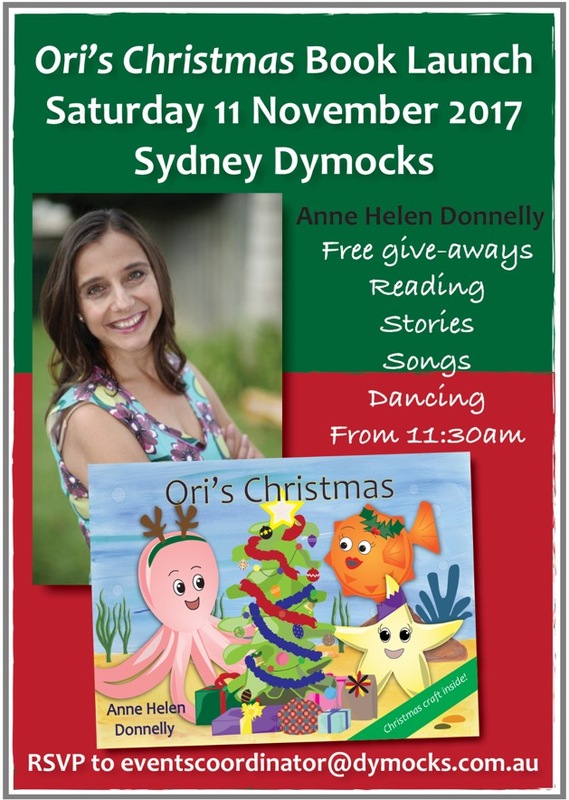 The book launch is on Nov 11th at Dymocks Sydney, more information on that to follow. But make a note as there’ll be stories, singing, dancing and loads of free give-aways! Please let us know where we can find out more about you and your author. We’d love to come by and visit! My author’s website is www.annehelendonnelly.com. See About Anne for more information on her but if you want some real fun go to the Activities tab for loads of free activity sheets and Ori Videos for fun and entertaining vids to watch! All child safe and friendly. It’s Time to Play! 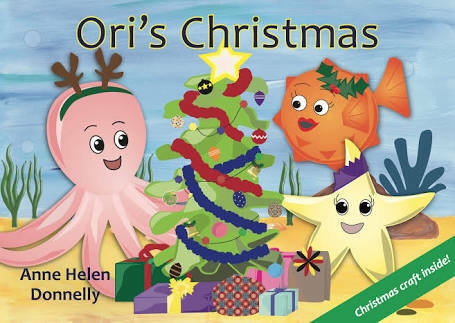 Ori’s Christmas #BookGiveaway!